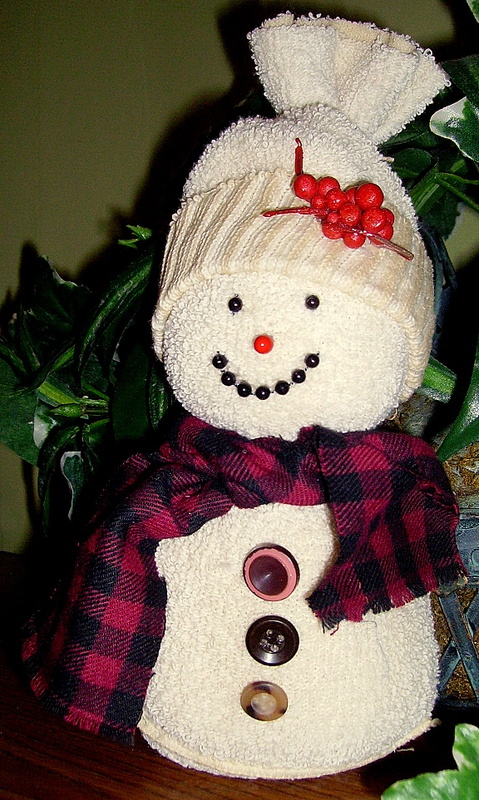 Our little country style, tea-dyed snowman is a no sew project. He is made from an old, white, adult sized sport sock that has been tea dyed. A great way to use socks with no mates. A few of these would make a nice grouping for a centerpiece. An inexpensive exchange gift could be made by putting a snowman in a basket with a couple of bags of hot chocolate mix and a Christmas mug. Directions are under “No-Sew Snowman,” in the Christmas Projects Gallery in the sidebar. This entry was posted in Christmas Projects and tagged christmas arts and crafts, christmas arts and crafts for kids, christmas crafts, christmas projects for kids, no sew christmas snowman, no sew project, no sew snowman, snowman made from a sock, tea-dyed snowman. Bookmark the permalink.